Mogul is running another amazing gaming giveaway to gift one of their fans with a brand new gaming laptop! 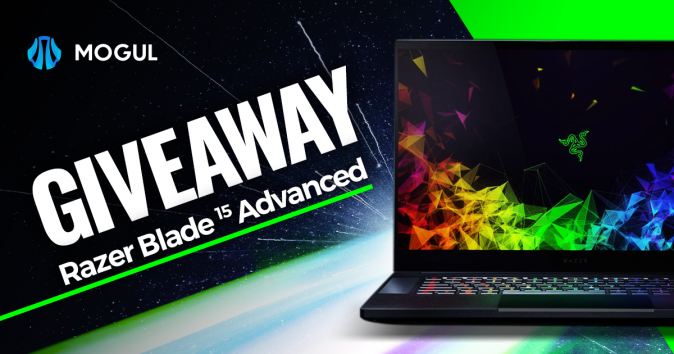 To enter in this Razer Blade 15 Advanced Gaming Laptop Giveawaygrab your free entries by following few simple steps listed down below! The world’s smallest 15.6” gaming laptop, the Razer Blade 15, is available in two different configurations. The updated Advanced Model now features the latest NVIDIA GeForce RTX graphics and 144Hz Full HD display for the ultimate gaming experience. The Base Model delivers amazing on-the-go gaming driven by the NVIDIA GeForce GTX 1060 along with dual storage. Powered by an 8th Gen Intel Core i7 6 core processor and available with the new NVIDIA GeForce RTX 20 Series graphics with Max-Q design. Experience real-time ray tracing, artificial intelligence, and programmable shading with the Turing based GeForce RTX graphics. Go full throttle simultaneously playing and streaming, or using the latest creative apps to edit videos. Bonus entries: Share your referral link with friends to get an additional 25 entries for each person who enters through the link. The winner will be displayed on this page within 24 hours of the giveaway ending, and also contacted via email and on Twitter.